When it comes to awards season, a good host like Neil Patrick Harris can make watching the long ceremony a total breeze while a bad one (looking at you James Franco) will have you praying for it all to end. Nailing the right emcee isn’t the easiest task and it seems like the Golden Globes could be onto a winner, as they’ve just announced an unlikely pair for their upcoming 2019 show. 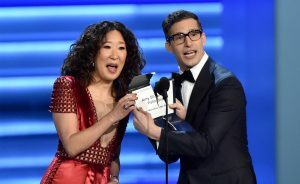 It was officially announced last night that they had be turning to not one, but two co-hosts for next year’s ceremony so congrats are in order for Brooklyn Nine-Nine’s Andy Samberg and Sandra Oh. They’ll be taking the helm for the three hour ceremony, which will be aired on NBC in the US at January 6. The Golden Globe Awards differ from the Oscars in that they celebrate the best of both film and television, which makes sense given that both Oh and Samberg are some of TV’s biggest stars at the moment. Last year, former SNL head writer and late show host Seth Meyers presented in a ceremony dominated by the #MeToo movement. If it sounds like a pretty random team up, it’s not as strange as you think it is. In fact, the pair have actually done a little presenting together before as they presented the Emmy for Outstanding Directing for a Comedy Series earlier this 2018. TBH we’ve got high hopes for the pair after seeing their routine, which drew some big laughs from the crowd. ‘I shouldn’t have done that. Should we just make it up?’ she asked him. Despite Samberg telling her in no uncertain terms that they could not make it up, Oh had other plans. Eventually the pair revealed that the winner was actually Amy Sherman-Palladino, who was recognised for her work on The Marvelous Mrs. Maisel. If her name sounds familiar, it’s because she created Gilmore Girls and she’s something of a giant in the industry. Accompanying her post was a hand drawn picture of somebody that looked absolutely nothing like Andy Samberg. TBH we’re glad she’s nailing it in Killing Eve at the moment because a pivot to painting is definitely not in the cards for the Grey’s Anatomy alum. Honestly, we’re over the moon about this news. The 76th Golden Globes will air in the US on January 6th. The post Andy Samberg and Sandra Oh are next year’s Golden Globe hosts appeared first on Marie Claire.